Acura unveiled the new NSX Concept last year at the 2012 Detroit Auto show, and this year they showcased an updated version of the concept vehicle as you can see in the gallery of photos above and in the video below. The new version of this supercar now has an interior but is still probably two years away from production. Acura is looking to communicate a supercar attitude and a high-tech feel, and they’ve certainly achieved that will this aggressive design. 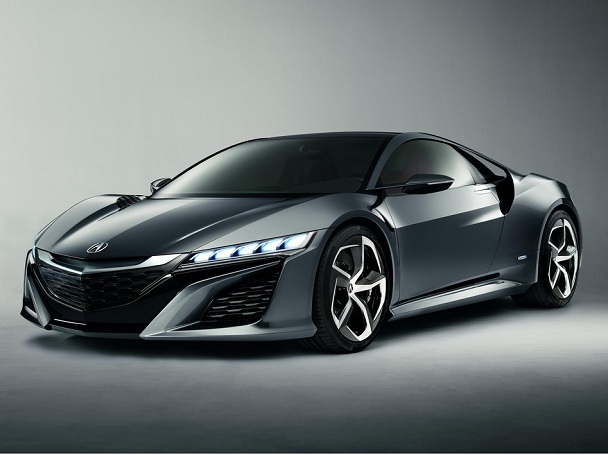 Acura also wants to combine its next-generation supercar capabilities with advanced environmental performance, so they announced last year that the Acura NSX will be powered by a mid-mounted, direct-injected V-6 engine mated to Acura’s Sport Hybrid SH-AWD (Super Handling All-Wheel Drive) system. This is an all-new, three-motor high-performance hybrid system that combines torque vectoring all-wheel drive with advanced hybrid efficiency through the use of three electric motors – one motor integrated with the V-6 engine and two motors driving the front wheels – along with an all-new dual-clutch transmission. The system enables instant delivery of negative or positive torque to the front wheels during cornering to achieve a new level of driving performance unparalleled by current AWD systems. Acura will definitely get plenty of well-deserved attention for this update, and supercar enthusiasts will definitely be waiting impatiently for a chance to drive this beautiful beast. Finally, in more good news for US manufacturing, the new NSX will be manufactured at a new production facility in central Ohio. We’re looking forward to it.